You Can Have It All – Water Softening and Better Taste In One System. The Culligan High Efficiency Municipal Water Conditioner is an all-in-one solution that gives you all the benefits of water softening and water filtration. It can reduce the taste of chlorine* and provide soft water all at once. The High Efficiency Municipal Water Conditioner is one of the most intelligent water treatment solutions from your local Culligan Man. Your local Culligan Man can recommend the right water conditioner solution for you. Provides clean softened water at every tap in the house. Controls your softener from anywhere in the house. Notifies your local Culligan Man automatically when the unit needs servicing so you never have to worry. Makes your water taste better. Saves salt, water and money. 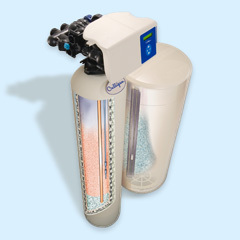 An all-in-one solution: Softens your water and reduces chlorine** that affect taste and odor. With the HE Municipal System, you’ll enjoy all the benefits of having soft, treated water at every tap in your home. Exclusive, non-corrosive 1” valve with 6 cycles. The motorized pistons provide more reliability than rotary valve systems. High-impact Quadra-Hull® Tank stands up to outdoor use with a four-layer design that resists UV rays, rust and corrosion. Limited lifetime warranty*. Activated carbon media: Absorbs chlorine taste and odor. Third Party Validation: Culligan’s HE Series Municipal system have third party validation by WQA (WQA Gold Seal) and UL which assures your Culligan filter has been manufactured under the highest of industry standards. *Warranties available separately. See written warranties for applicable terms and conditions. **Substances not necessarily in your water.